“Collective States”, curated by Paola Anselmi, brings together a range of artists whose work is not immediately similar. In so doing, Anselmi emphasises points of connection across a range of art practices, showcasing the diversity of work created by mid-career WA artists as well as the ways in which these practices can unexpectedly overlap, collide or intersect. 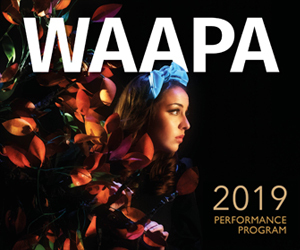 Featuring the work of Christophe Canato, Jennifer Cochrane, Mel Dare, Louise Dickmann, Jane Finlay, Indra Geidans, Paul Kaptein, Susan Roux, Vanessa Russ and Lynnette Voevodin, the exhibition variously displays work that examines bodies, patterns, textures and the WA landscape. Many of the works are exploratory, portraying their subject matters in unexpected ways. Christophe Canato’s Galerie de Portrait #1-8 is a series of portraits with impossibly placed features – ears are twisted upside down, or placed in the middle of the forehead, emerging from the centre. The images are slightly unsettling, with the “wrongness” of the features challenging the unity of a single face and creating multiple anonymous identities within each image. This theme of images revealing multitudes or challenging initial appearances is carried through to other works in the exhibition, such as Jennifer Cochrane’s Impossible Shadow sculptures, which emerge from corners, working with the architecture of the space to create shadows and patterns where none previously existed. Other artists examine the tropes and common narratives of the WA landscape, with Indra Geidan’s The State I’m In placing emphasis on roadkill, four-wheel drives, and native flora and fauna, juxtaposed against the kitchiness of the State Museum’s souvenir teaspoons (hanging neatly on an Australia-shaped rack) and crockery sets. 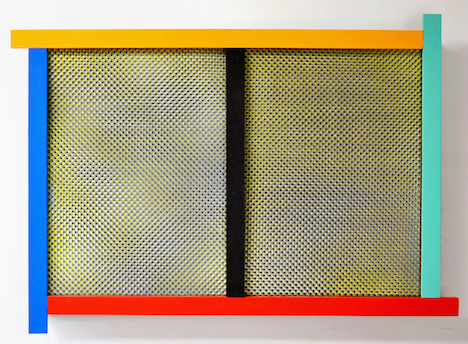 Negotiating the vicissitudes of a long friendship: Bevan Honey and Paul Moncrieff, ‘BHPM8’, spraypaint on canvas, acrylic paint on plywood, 70 x 50cm. In “BHPM”, Bevan Honey and Paul Moncrieff use their art practices to negotiate the vicissitudes of a long friendship; the challenges of communication and distance as well as its benefits and rewards. Over the past three years, the artists have been exchanging works and intervening with paint or construction additions, overlapping or alongside the original piece. The results are structured objects or assemblages of (variously) acrylic, plywood, spray paint and metal, all which seem remarkably unified and considered – a mark of the ultimate benefits of ongoing negotiation and collaboration. These collaborations are the physical results of a friendship and creative relationship that prioritises change, the unexpected and responsivity. In both exhibitions, points of connections emerge between and across individual works, creating an interestingly layered showcase of WA artists. Both exhibitions continue until December 22. 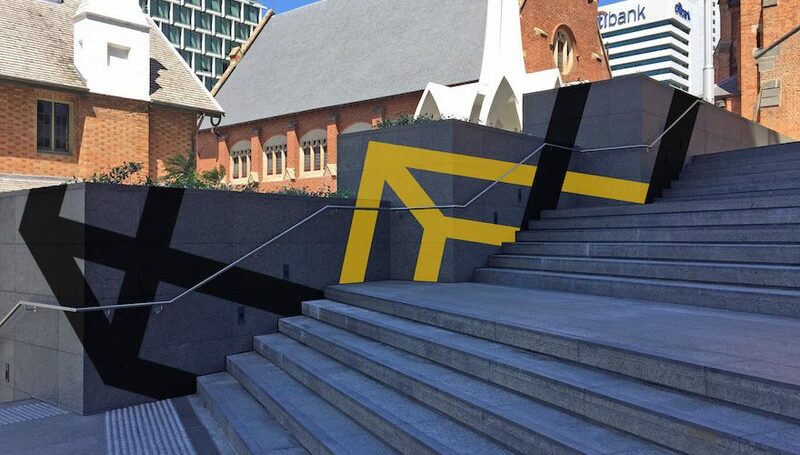 Pictured top is Jennifer Cochrane’s “Old Shadows, New Shadows”, 2018, tape on steps in Cathedral Square, Perth, variable dimensions. Courtesy Art Collective WA.